When you think about iconic national parks around the world, perhaps the likes of Yosemite, Denali, the Grand Canyon or the Mighty 5 parks in Utah would spring to mind. However, following our recent Ireland road trip, we would argue that Killarney National Park should also be on your radar. It may not have the reputation as some of these more infamous counterparts across the globe but we are convinced it is equally breathtaking in its own right. 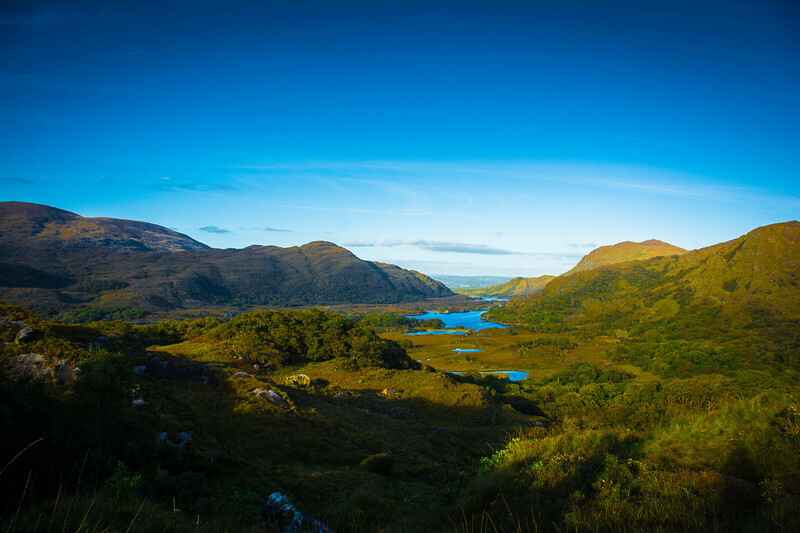 A Killarney National Park tour is an experience you won’t forget and epitomizes the natural beauty throughout a nation we love to call the Emerald Isle! Take a moment to consider the components of a spectacular national park. I’m sure we all have unique perspectives and opinions on this but I think there is probably some common ground. Firstly, natural beauty! It goes without saying any area of the world that has been classified with national park status “should” have some form of natural beauty. Again, we all have very different thoughts on what constitutes beauty but I have always been a firm believer in the phrase “an untouched wilderness” which I think should appropriately describe all national parks. Killarney National Park undoubtedly fits this category. As you embark on a journey through this park, regardless of your form of transportation, you cannot help but fall in love with the “natural beauty” this park possesses. Ireland is renowned for being “green” in more ways that one and when you combine this with the amazing natural beauty throughout the national park, it’s certainly a picture-perfect scene on many levels! Secondly, an area of conservation! Anyone visiting a national park will not only have the opportunity to see breathtaking natural formations but also “hopefully” encounter wildlife in their natural habitat. Killarney National Park is home to a herd of native red deer along with a myriad of other species that makes this an amazing spot for wildlife experts to enjoy. 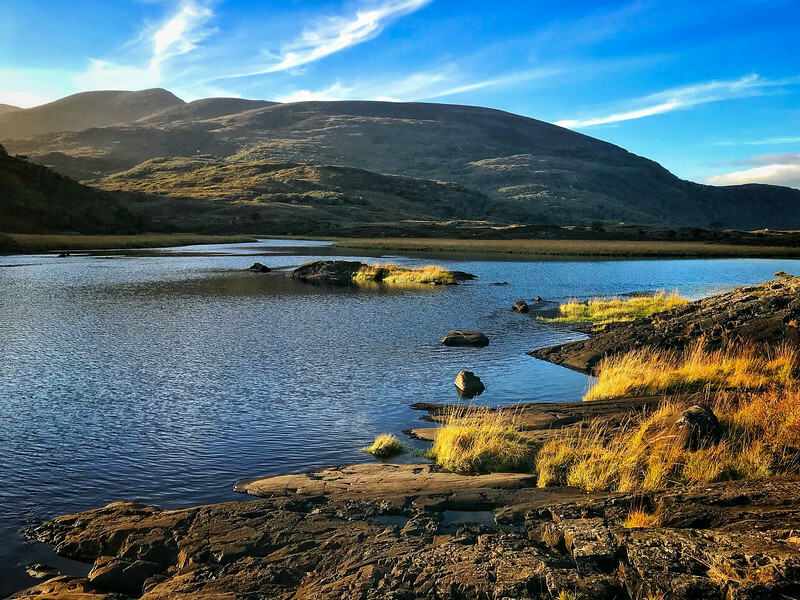 Let’s take a look at some of the best spots worth experiencing during a Killarney National Park tour! The uniqueness of this national park means that not only will you encounter the aforementioned attractions but also a plethora of history and ancient architecture that you normally wouldn’t associate with a national park. 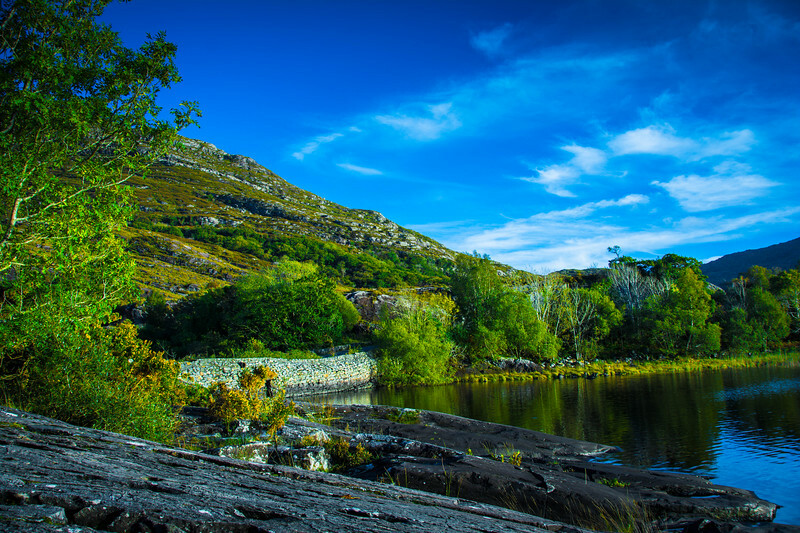 Visitors to Killarney National Park could easily spend several days hiking around and exploring this haven of natural beauty. 26,000 acres or 40 square miles is definitely a large enough area to keep you occupied for many days but if you only have a short time to explore, don’t worry, hopefully, this handy guide will give you a few of the very best attractions not to be missed. We are going to focus on attractions that are just a short distance from the town of Killarney. It’s feasible that you could rent a bicycle and then head into the park to explore all of these attractions. Alternatively, taking a rental car through the narrow, winding roads is a roller-coaster experience not to be missed. If you are confident driving on the left side of the road, this will be a thoroughly enjoyable experience but for those that hold any fears, perhaps it’s not for you! 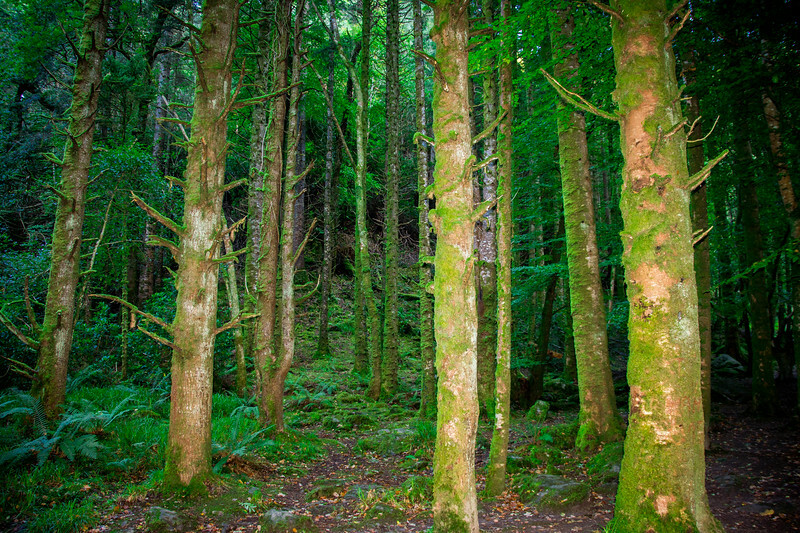 From just a few hours to several days, there is something for everyone to enjoy in Killarney National Park. Historians, architects, naturists and more will have an awesome time visiting this part of Ireland and we are already excited about returning to this spot to explore further. 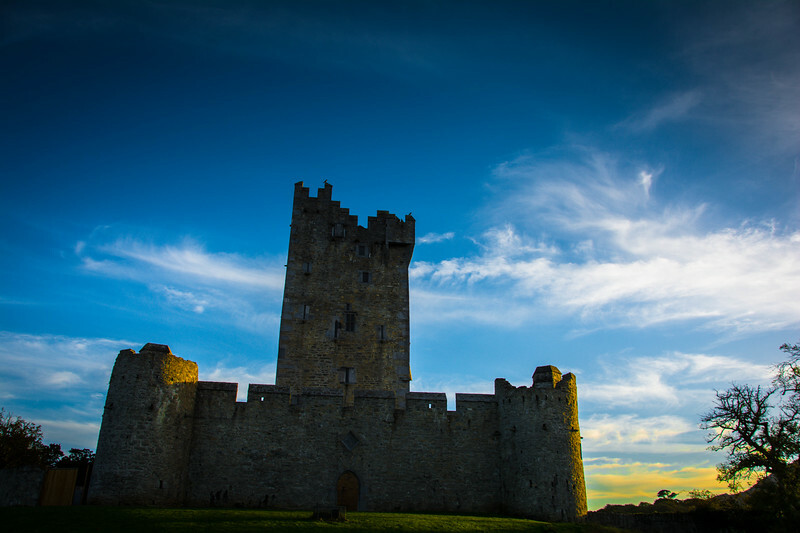 What better way to start your journey into Killarney National Park than by visiting one of the most historic locations in the region – Ross Castle. Just a few minutes from Killarney town center, the remains of Ross Castle stand proudly overlooking Lough Leane and Innisfallen Island in the distance. 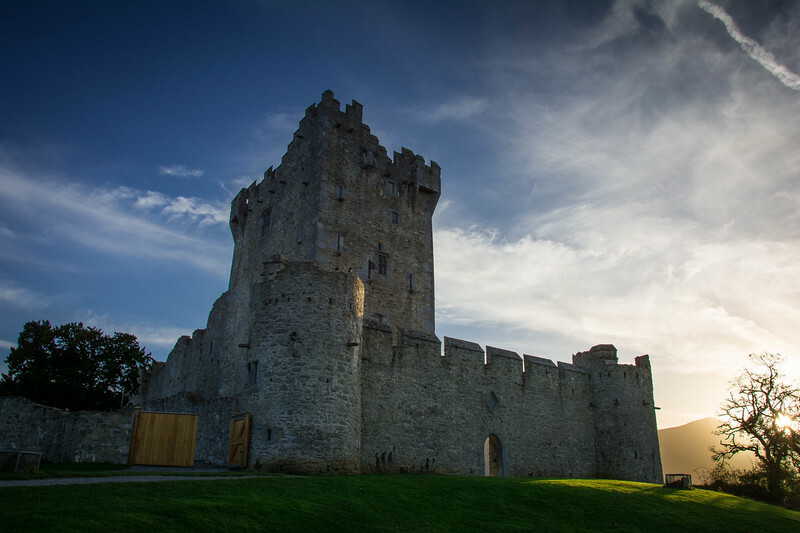 Dating back to the 15th-century, Ross Castle is a distinctive tower house construction and visitors can enjoy daily guided tours of this structure. 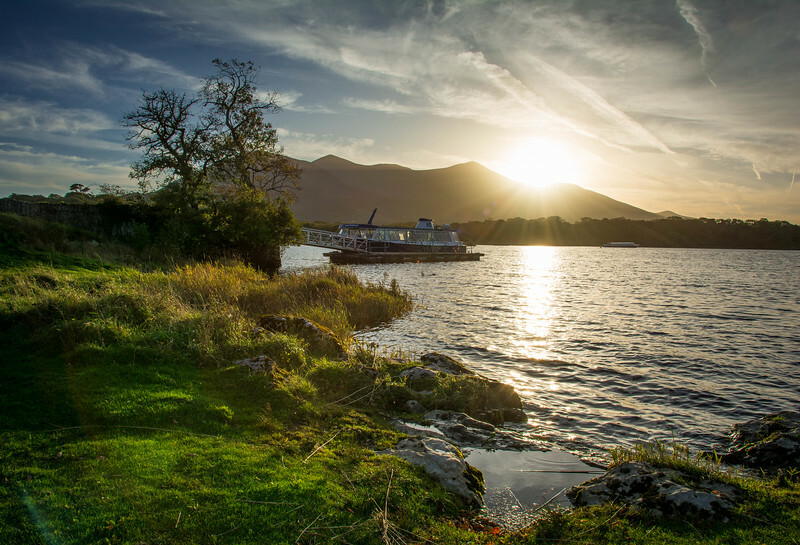 However, for those of you that prefer to enjoy a self-guided experience, simply take a stroll around the banks of Lough Leane and admire the stunning scenery. 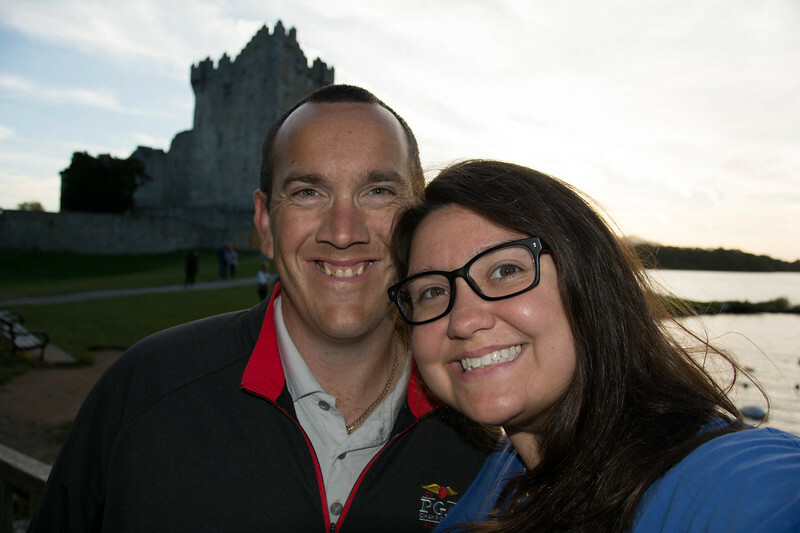 As you can see, we visited Ross Castle just before sunset and captured a gorgeous shot with the castle, lake and breathtaking natural surroundings in the background. 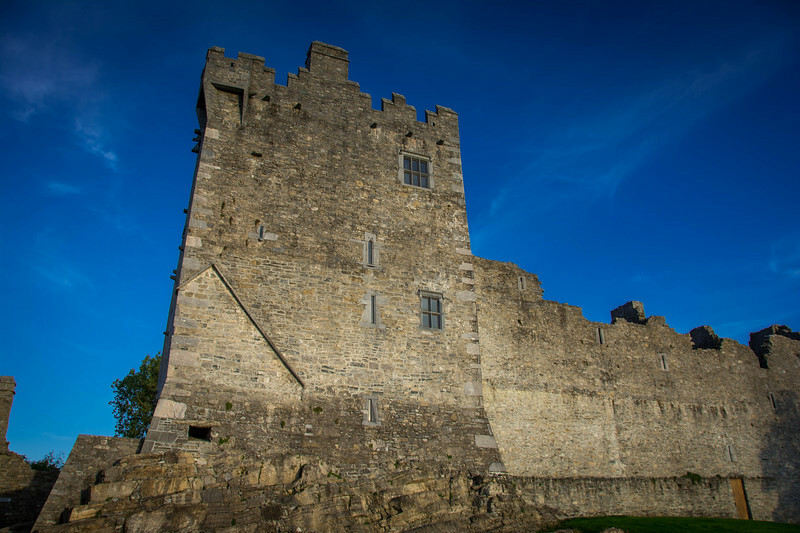 Ready for a quick history lesson on Ross Castle? It is renowned for being one of the last strongholds to fall to Cromwell’s forces in the 1650’s. A fun fact for the day but regardless of your desire to learn about ancient Irish history, it’s hard to ignore the beauty of this attraction. Let’s move forward to a little more recent times or at least the 19th-century. Possibly one of the most iconic attractions throughout all of Killarney National Park is Muckross House. With a breathtaking sight overlooking Muckross Lake, this house was designed by Scottish architect William Burns for Henry Arthur Herbert and his wife Mary Balfour. 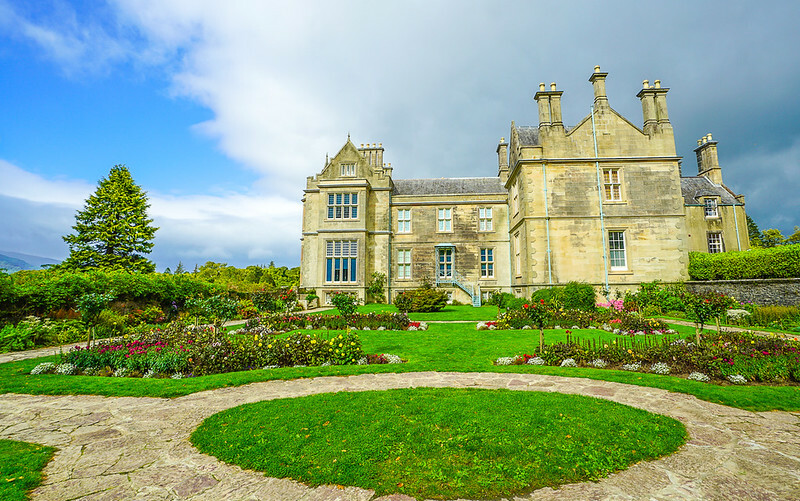 Muckross House is a typical Tudor style design and epitomizes the luxurious lifestyle that Herbert and Balfour lived during the mid 19th-century. The house was sold and passed along to various owners over the next century until it was donated in 1932 and renovated/preserved into the property we see today. 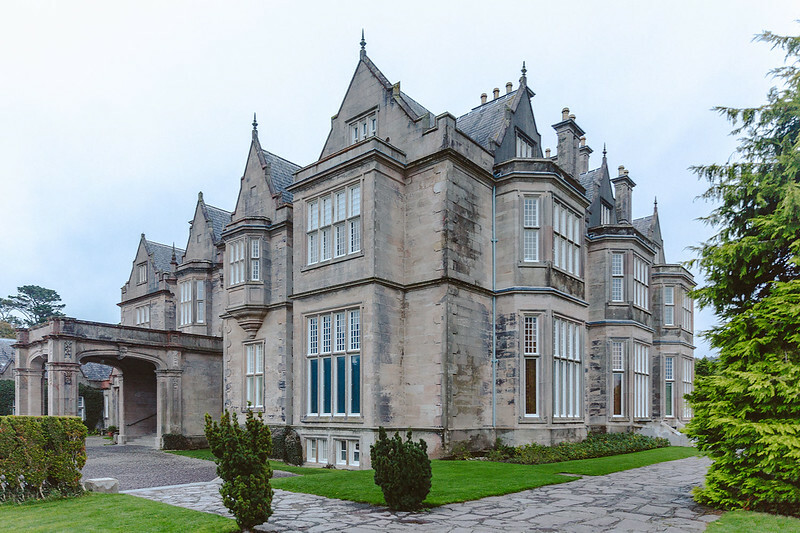 If you are planning a visit to Killarney, be sure to visit Muckross House and step inside to admire the luxurious property that is the focal point of the national park. 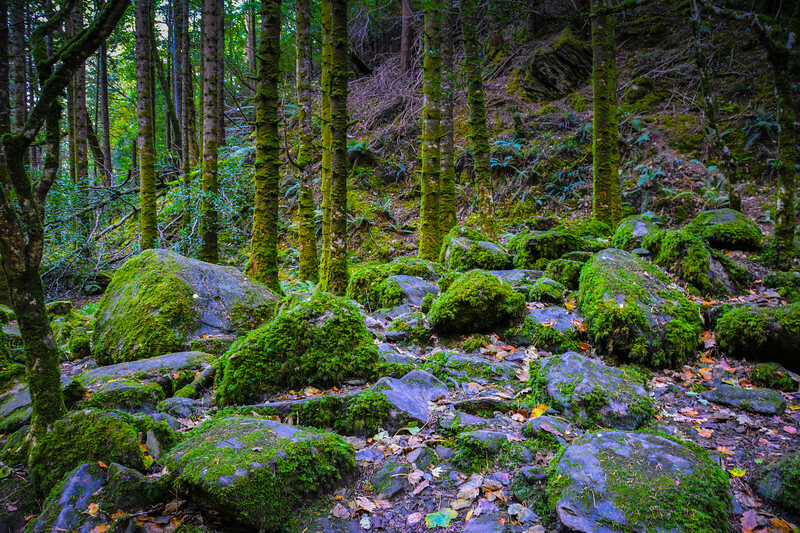 After visiting Ross Castle and Muckross House, you could be forgiven for wanting to head away from architecture and start exploring some of the national parks natural beauty. Don’t worry, you won’t have to wait long! 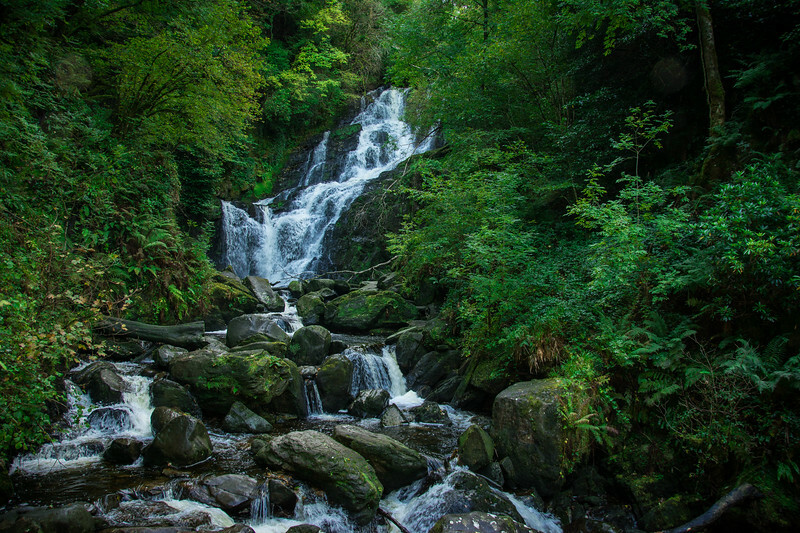 Just a few miles from both of these architectural masterpieces is the gorgeous Torc Waterfall. 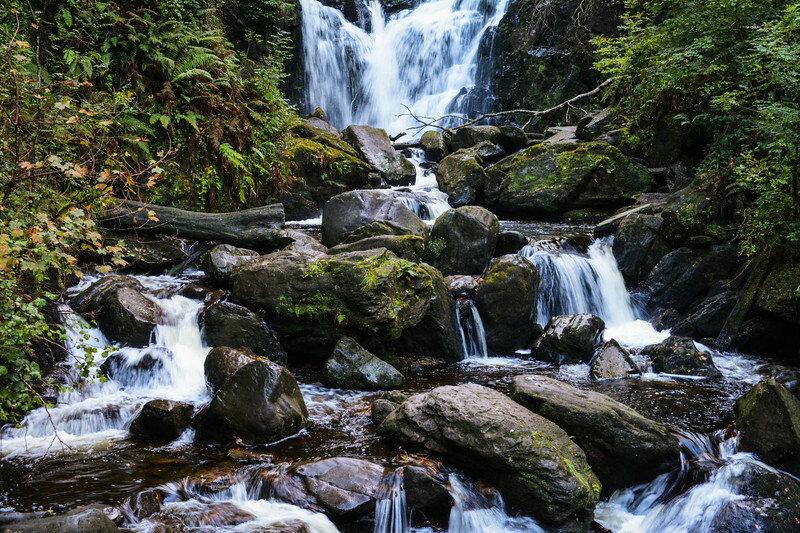 The beauty of Torc Waterfall isn’t necessarily related to the size, though at 70-80 feet in height it’s certainly more than a trickle. 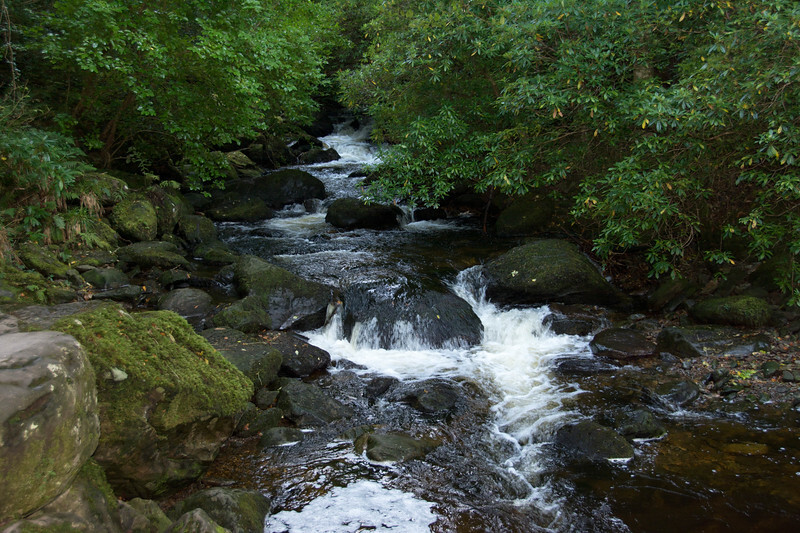 The real beauty is the location and the surroundings in the heart of a wooded area in Killarney National Park. 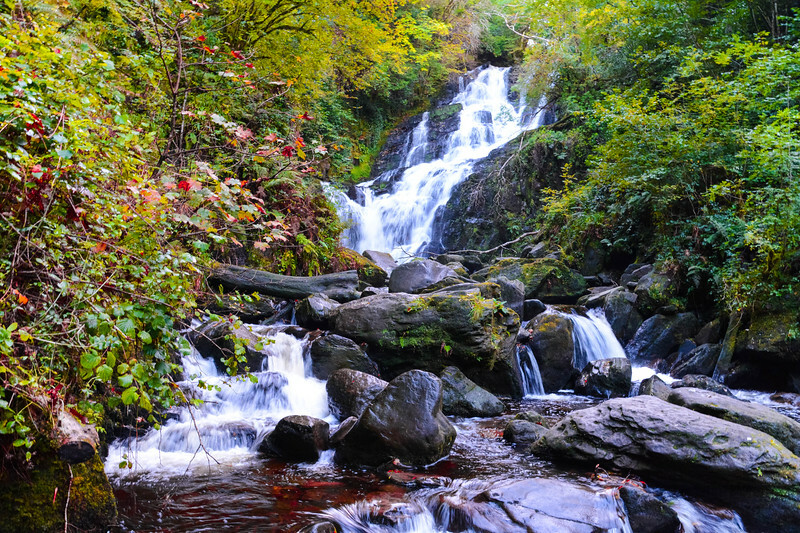 Visitors wishing to experience Torc Waterfall have a couple of options. 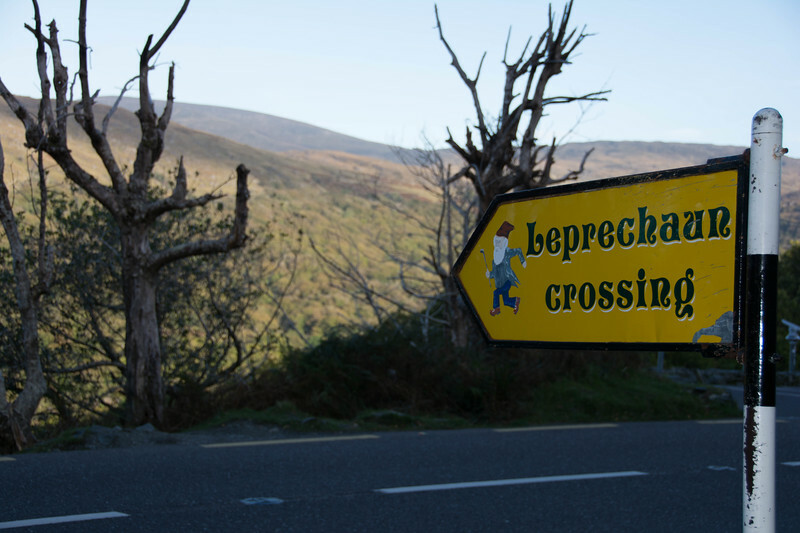 The easiest and shortest option is to park at the designated car park along the Ring of Kerry (option A on the map) and take the short 5-minute walk through the woods to the waterfall. 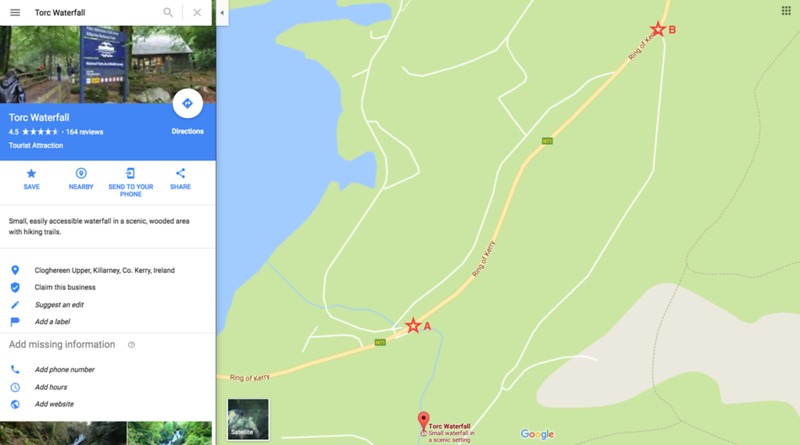 However, for those of you that are a little more adventurous and want to hike a little further, there is an alternative route that you can take (option B on the map) and you can follow the hiking trail down to Torc Waterfall. Be prepared for a pretty strenuous climb back to your car but the experience through the scenic woodland is likely worth the effort! 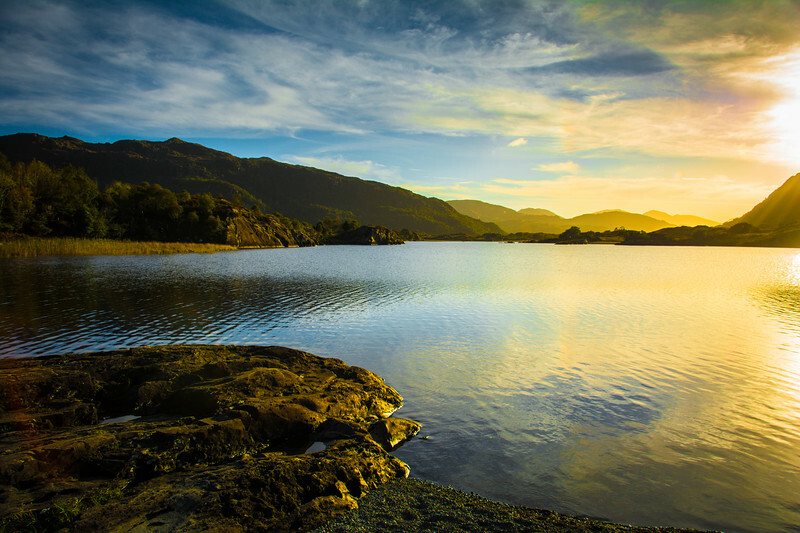 Killarney National Park is home to three gorgeous lakes known unsurprisingly as the “Lakes of Killarney.” Comprising of Lough Leane, Muckross Lake, and Upper Lake, these lakes are areas of spectacular scenery and attract visitors from all corners of the globe every year. Lake tours are available but for those of you want a more secluded experience, enjoy the various hiking trails that allow you to explore all around each of the lakes. Lough Leane is the largest and northernmost of the three lakes and is located closest to Killarney. 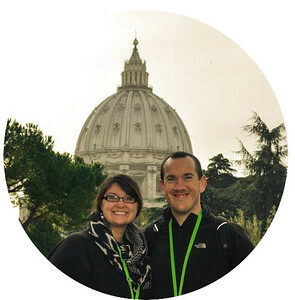 It is also the largest fresh body of water in this region of Ireland. 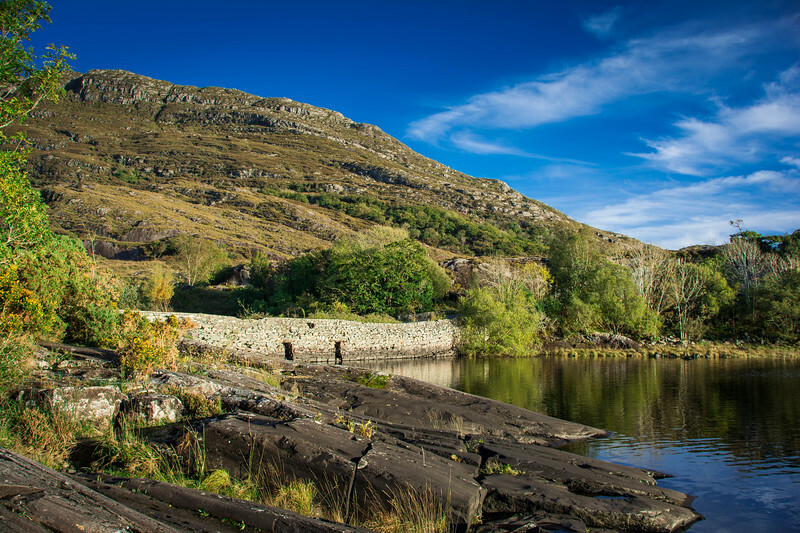 Leane is not only a perfect setting to enjoy both sunrise and sunset with the Kerry Mountains in the background, it is also home to a number of small forested islands scattered throughout the 4,700 acres of water. As we mentioned earlier, on the eastern shore of Leane is the iconic Ross Castle. 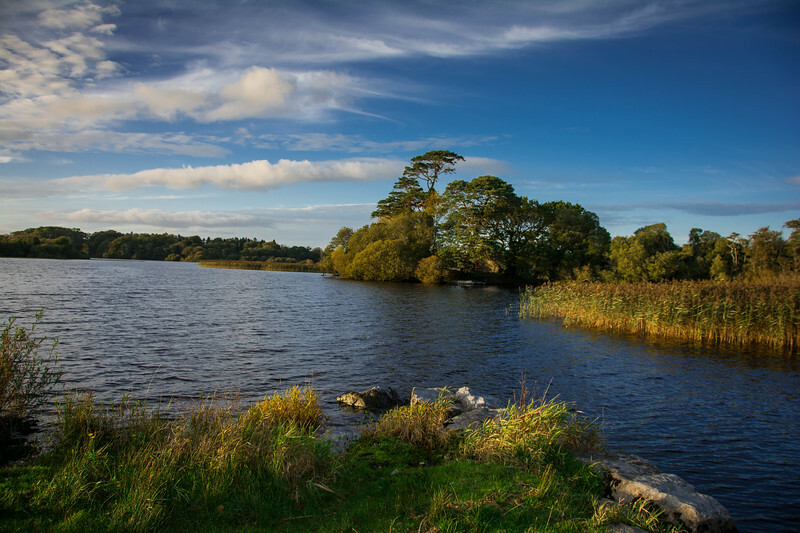 Muckross Lake is located south of Lough Leane and although it is substantially smaller, it is actually Ireland’s deepest lake measuring almost 250 feet in depth in certain parts. This is possibly the most famous of all three lakes given its name but also because it possesses over 6 miles of paved hiking trails that surround this lake. Upper Lake is the smallest of the three lakes and southernmost but for those of you that venture far enough into Killarney National Park to the “Ladies View”, this is the lake that will in the foreground of your pictures. 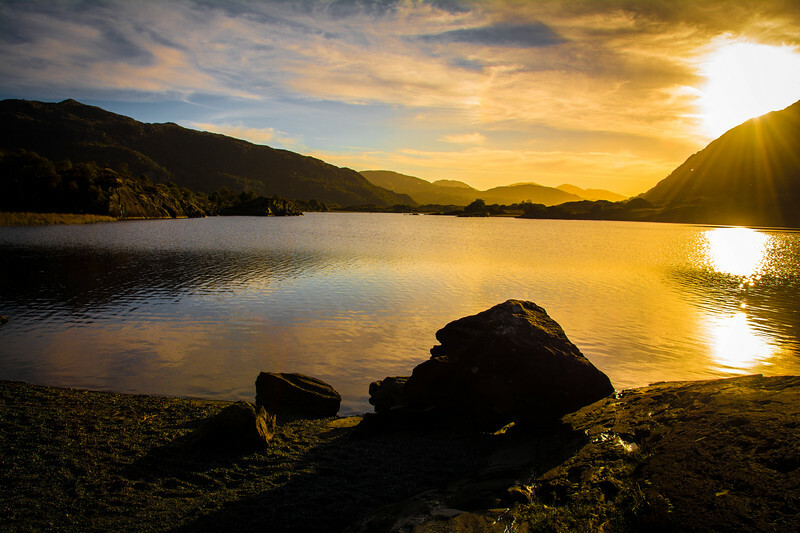 All three lakes offer distinctive features but together, they are a breathtaking formation that alone should justify a visit to Killarney National Park. 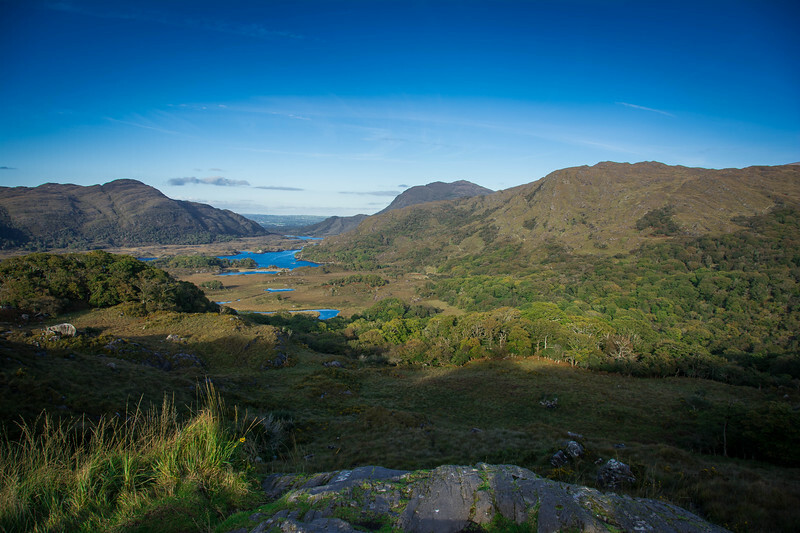 The Ladies View is a scenic overlook along the Ring of Kerry that provides breathtaking panoramic scenes of the Lakes of Killarney and beyond. 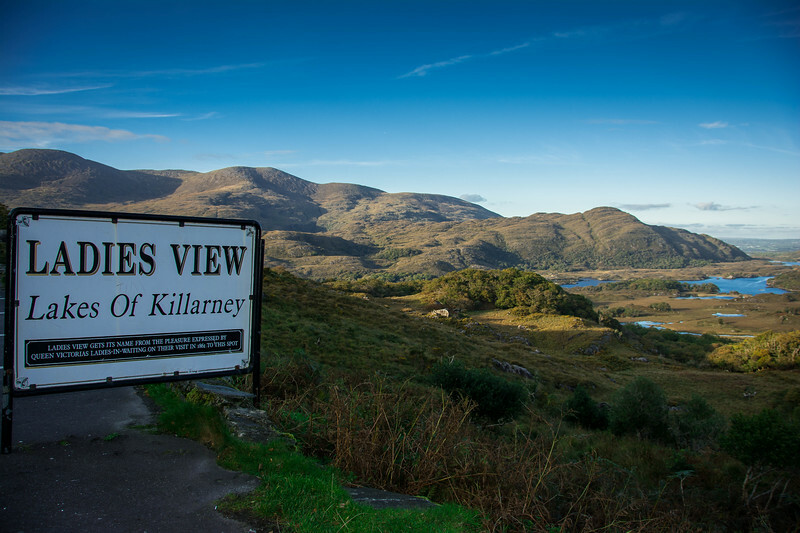 If you are the inquisitive type, you will be wondering where the name “Ladies View” originated. 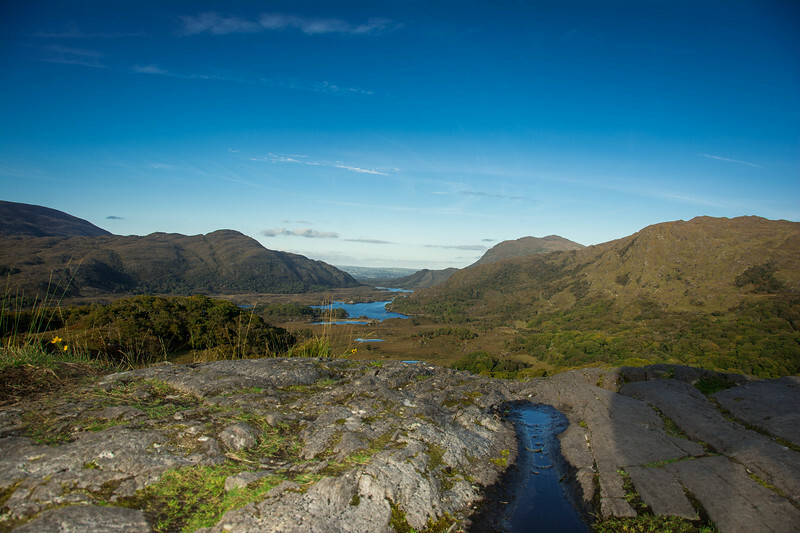 The name apparently stems from the admiration of the amazing views by Queen Victoria’s ladies-in-waiting during their visit to Killarney National Park in 1861. You learn something every day! A gift shop and cafe are available at this point for visitors who want to admire this scenery from the confines of the visitor center but we would argue the real beauty here is when you step away from the car park and onto the rocks that overlook the valley beneath you. When you visit the Ladies View, it’s one of those moments you will never forget. We were spoiled for breathtaking scenes throughout our road trip around Ireland but there were very few that were as spectacular as this scene. Take a quick hike to find your perfect spot and spend a few minutes (or longer) appreciating this view because it’s one that you will never tire of looking at. 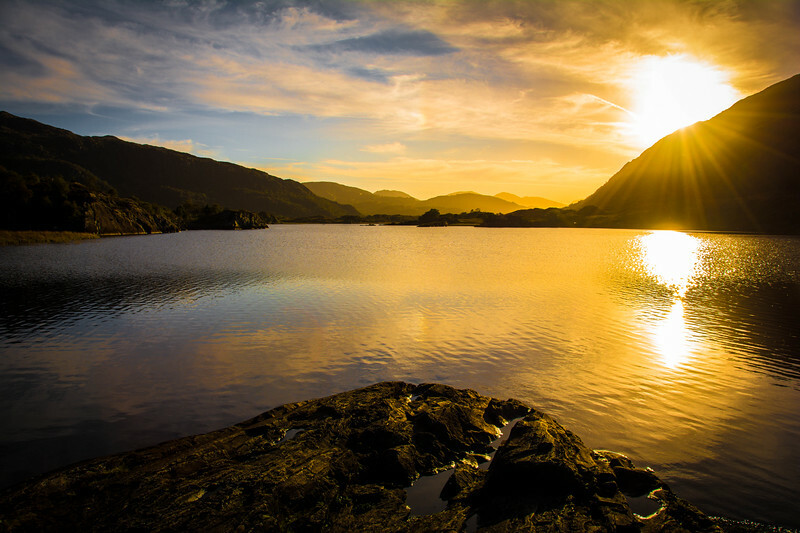 If you are fortunate enough to visit on a day when the sun is out, the view of the glistening lakes is a sight to behold surrounded by a myriad of other geological features that help create such a magical landscape. Ireland is a landscape of natural beauty. Everywhere you look, there is something spectacular waiting for you to explore. 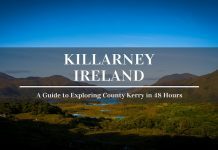 Killarney National Park certainly falls into this category and if you are planning a visit to the Emerald Isle in the near future, this is definitely a spot you should add to your itinerary. 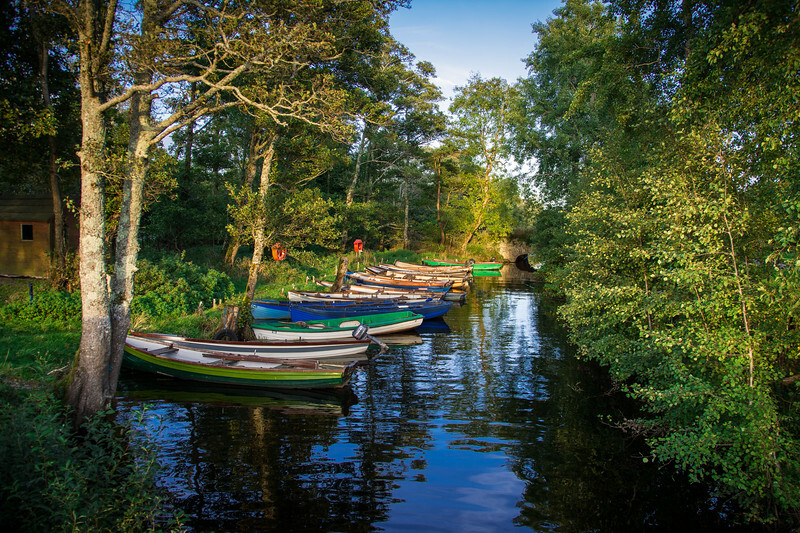 A self-guided tour of Killarney National Park will give you the opportunity to experience everything from history to amazing natural features. 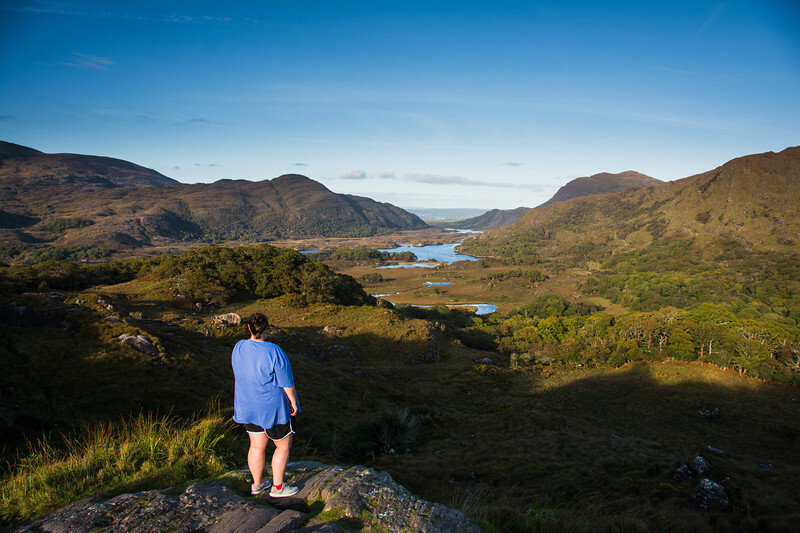 It’s difficult to pinpoint one exact spot that is our favorite but arguably the Ladies View encompasses everything Killarney National Park has to offer. 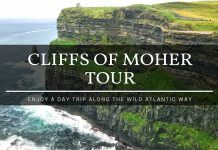 Previous articleCliffs of Moher Tour – How to Enjoy an Amazing Day Trip? 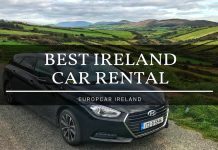 Next articleWhy Europcar Is the Best Car Rental Company in Ireland?